Cooled, then sliced. 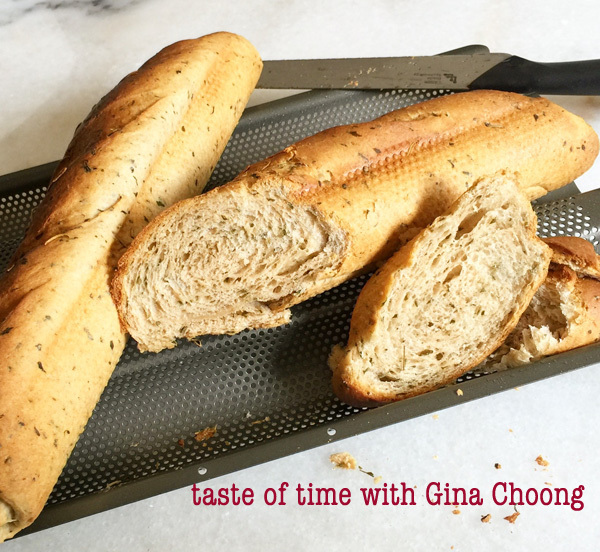 This is the Baguette version..long thin..
Just out of the oven. This is the leftover dough enough to make a small bun. 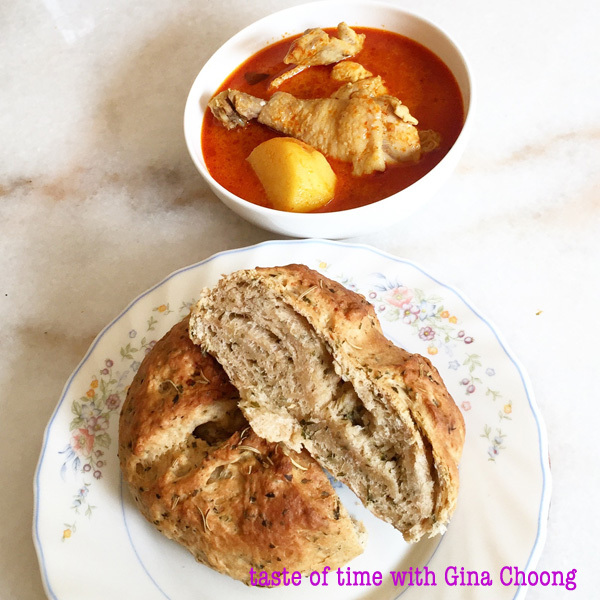 I loved it with home cooked Curry Chicken, potatoes..dipping the warmed bread into it. Yums! 1. Place flour, salt and mixed herbs in a mixing bowl, giving a good stir to mix evenly. 2. Scald 120ml of Fresh milk in a sauce pot till warmed. Pour into a bowl and add sugar to stir in till melted. Add remaining cold milk and stir evenly. Finally sprinkle yeast on top and leave it aside for 5 mins. 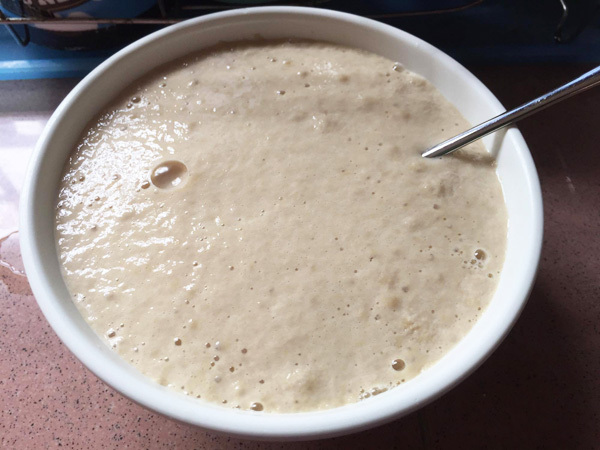 The yeast will foam in the bowl. Means its ready for use. This is how it looks like..bubbles on the top may appear. 3. Make a well in the centre of the flour and pour in yeast water. 4. Using a spatula, slowly mix in flour with the yeast. 5. 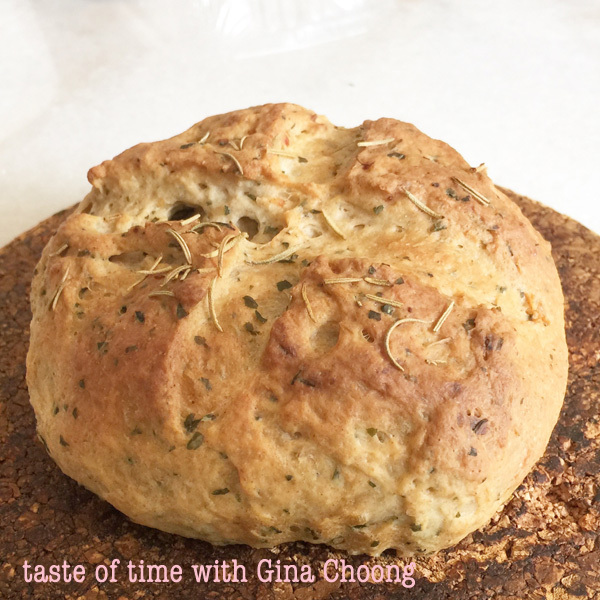 Pour olive oil into the flour mix and slowly knead till it forms into light and smooth dough. 6. Shape it into desired shapes and place into pans/loaf tins. 7. Spray water mist on the top and sprinkle some rosemary herbs over it. Cover the dough with a damp cloth. Left photo shows its shaped and place into round bun. Make a cross cut over the top and spray water over it. Then sprinkle rosemary herbs on top. Right photo shows after 45 minutes of proving time, it doubles up. This is the Baguette one. 9. Baked in preheated oven 220C for 25 minutes. Remove to cool and serve as you like it.